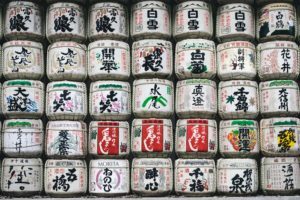 Last year, I was lucky enough to visit the Sapporo Snow Festival: a fantastic celebration of art and winter that happens in the capital city of Japan’s northern most island, Hokkaido. Giant ice and snow sculptures fill up the city, transforming it into a winter wonderland. A lot of people think of Japan’s most beautiful season as spring because this is when the cherry trees turn to their famous pink colour, but I prefer watching Sapporo City turn white under the snow. 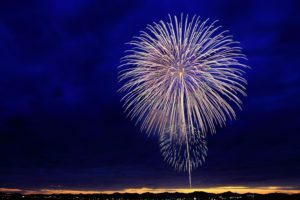 The festival is held in February every year, and the city itself is a sight to behold. All of the office buildings, sidewalks, and parks are caked in thick layers of snow. Despite this, I didn’t find the city to be very cold. There were no harsh winds when I went to the city, nor was there any heavy rain, just a soft snow fall that was surprisingly easy to deal with. The festival started in 1949 when some school kids decided to make snow men in the park. They made six snow men, and the locals thought it was sweet. They continued to make snow men every year, adding more and more detail to them. Five years down the line, the Japanese self-defence force decided to show up these local kids and used their massive amount of man power to construct giant snow sculptures, and thus the modern festival was born. The festival has grown every year and spread to three parts of the city. 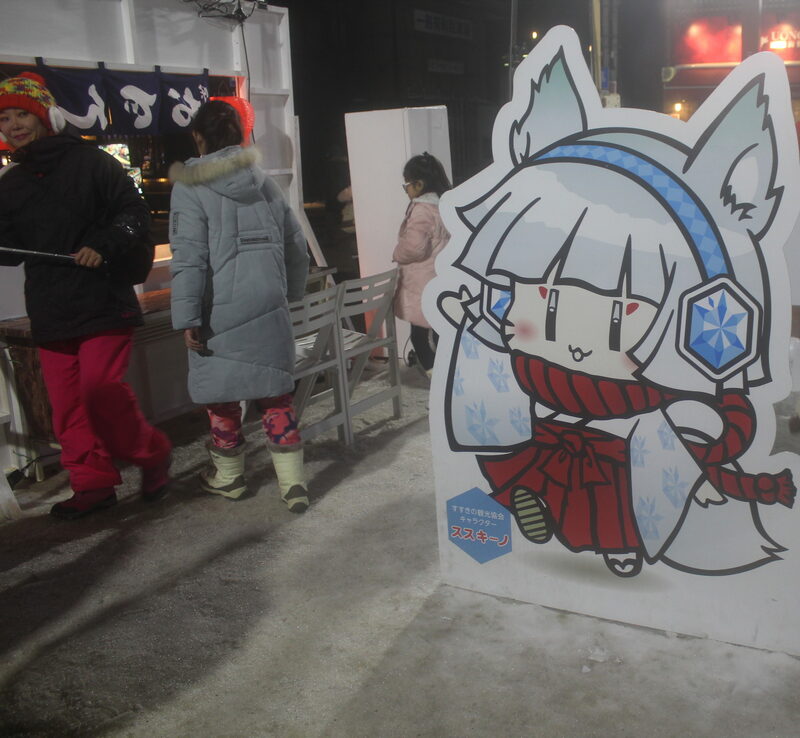 Farthest from the city center is the Tsudome section of the snow festival. The Sapporo Community Dome, also known as Tsudome, is a multi-purpose community center, sometimes being used for conventions or sports. Because of the large open area outside the city, you can toboggan down snow slopes and take part in snow ball throwing competitions. 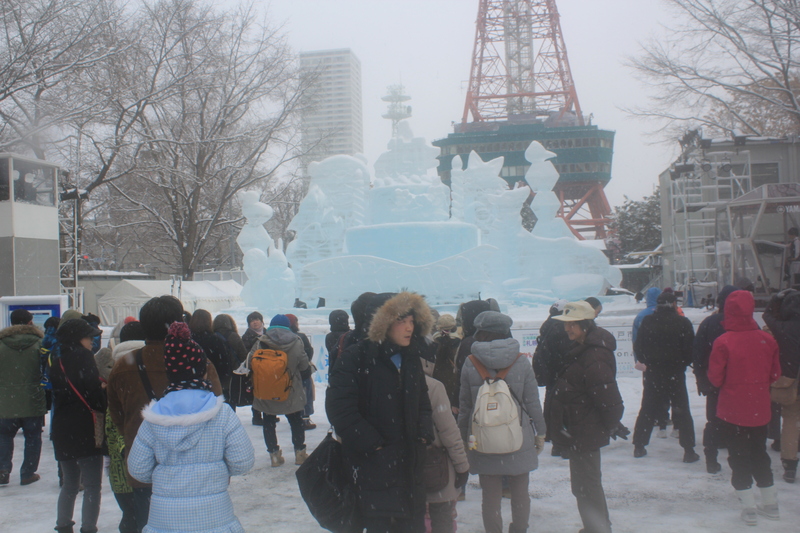 Another recent expansion of the festival is the ice festival in the entertainment district called Susukino. 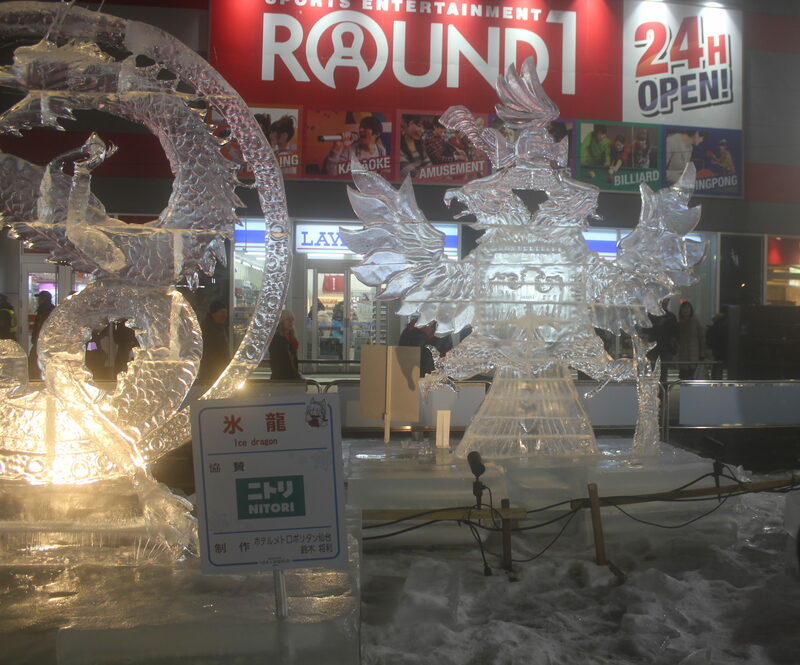 This has only been happening since 1983 and has a lot more company promotion, but seeing these intricate ice sculptures is definitely worth a visit. You can watch as artists carve blocks of ice with a chainsaw, transforming them into beautiful works of art. Even though the streets are lined with bars and restaurants it’s still very peaceful and easy to navigate. The ice sculptures go on for as far as the eye can see, stretching in a straight line down Sapporo’s main street. They are all beautiful, even the ones advertising drinks, and you can spend a lengthy evening just checking them all out. 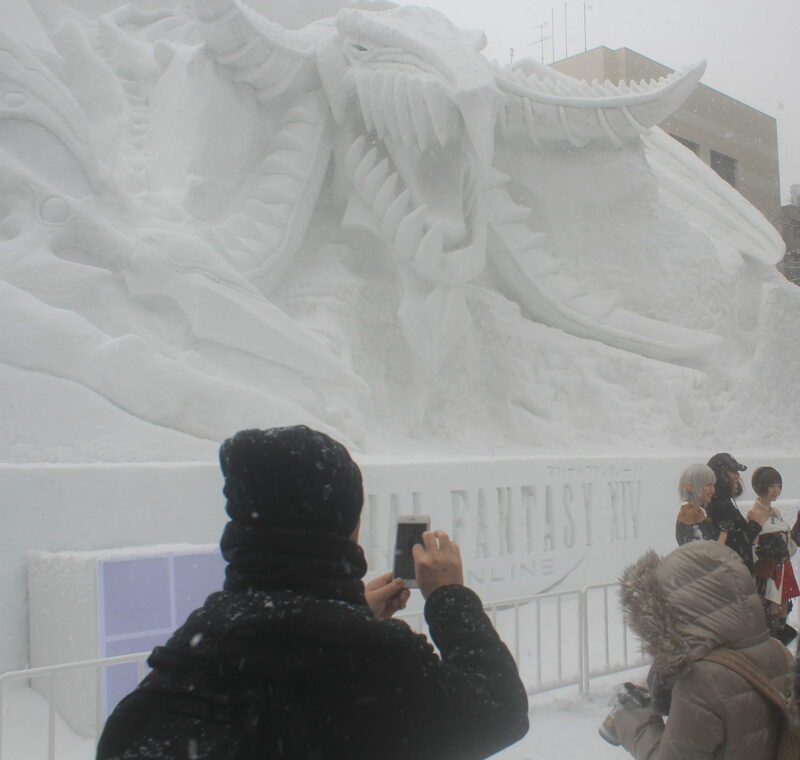 The final section of the snow festival is the original. 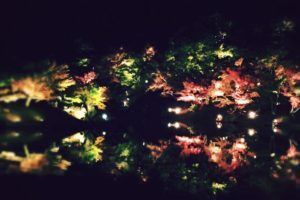 This happens right at the heart of the city, all through Odori Park. 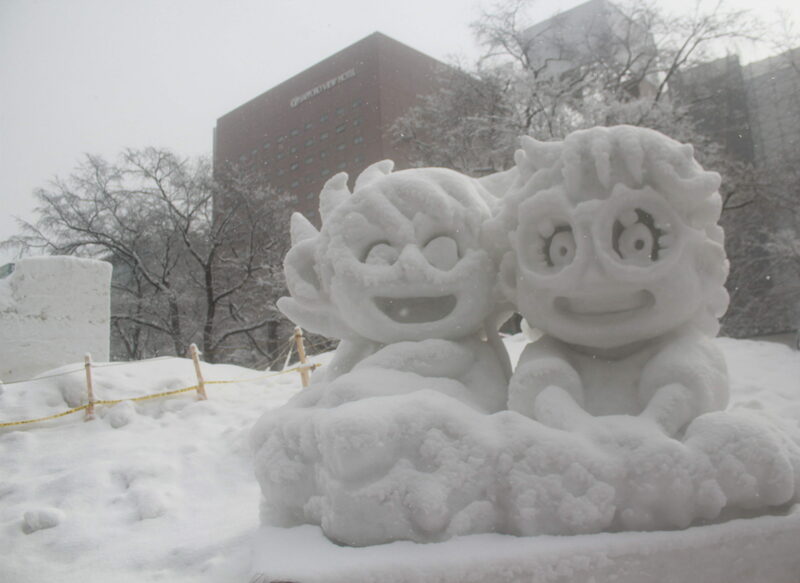 The strip of nature that all of Sapporo grows around is filled with fabulous snow sculptures. The park is beautiful by itself. It has a tower reminiscent of the Eiffel Tower, and has some beautiful trees, but the park is most beautiful when it is covered in a blanket of fresh white snow. Artists from all over the world come to the park and use the snow to create masterpieces. They spend weeks crafting sculptures of a near impossibly immense scope. You can walk up and down the park following the crowds, and every couple of meters you will see a new breath taking sculpture. All of them are made from snow and they are fantastically detailed. They range from a couple of meters tall and wide to the size of an apartment building. The first sculpture that blew me away was the Final Fantasy sculpture, complete with people in cosplay as the characters. I asked them if they were at all cold in those skimpy outfits and they said “no” without even a shiver. The dueling snow dragons in the sculpture were massive and got lit up at night with music and sound effects to show the battle. 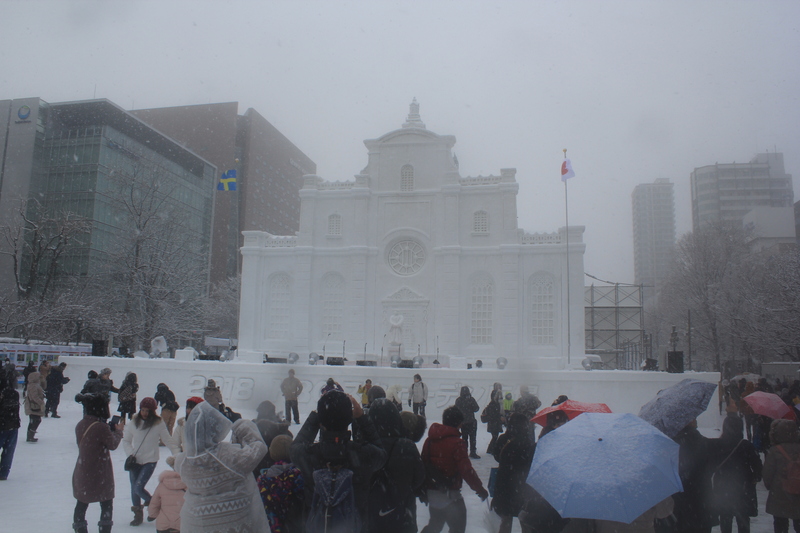 There were also three famous buildings recreated in ice, one from Taiwan, one from Sweden, and another from the Japanese city of Nara. 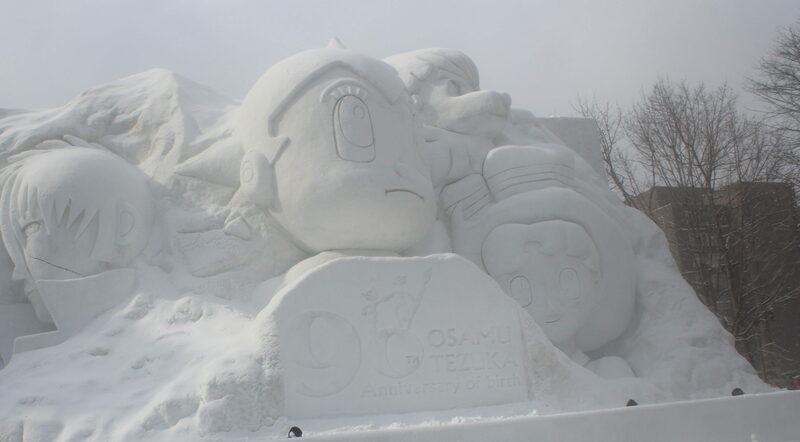 A sculpture to promote the new anime sensation ‘Love Live!’ was very popular, and the biggest sculpture at the festival was one of Astroboy. Each was a site to behold, the level of detail and scope was flabbergasting and they weren’t the only snow sculptures. There were tens of smaller sculptures, and an international snow art competition with artists from all around the world was also being held. As you walk around and try to snap the perfect picture of these snow masterpieces, you also get the chance to buy souvenirs from festival stalls as well as try local foods. Hokkaido is famous for its crab and potatoes. 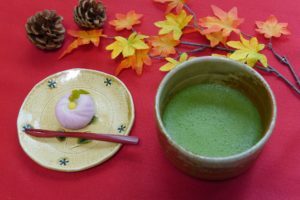 You can walk around the festival with these on a stick, enjoying the delicious tastes that come with a colder climate than the rest of Japan. The festival heavily features the famous Japanese character Hatsune Miku. In case you’re not familiar with this character, she was originally a mascot for a vocaloid computer program but exploded in popularity both in Japan and overseas. What a lot of people might not know is that Hatsune Miku’s home town is Sapporo. So, you are sure to find sculptures of her along with a lot of posters and merchandise. To sum up, Sapporo is a beautiful city and a fantastic place for anybody who loves snow. 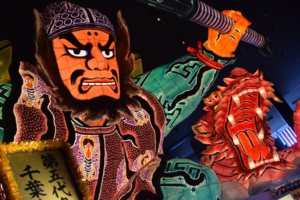 Although it can be hard to get to, if you’re in Japan next February it is definitely worth visiting the snow festival and seeing what the northern reaches of Japan have to offer. Susukino Site is open for visitors any time. The snow and ice sculptures are illuminated until 11 p.m. (until 10 p.m. on the last day). Tsudome Site is open from 9 a.m. to 5 p.m.
Odori Site: Get off at Odori Station on Subway Nanboku Line, Tozai Line, or Toho Line. Tsudome Site: A 15-minute walk after getting off at Sakaemachi Station on Subway Toho Line. 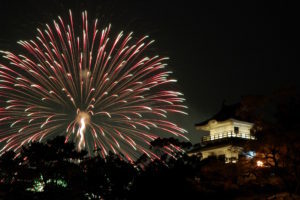 There are also shuttle bus services from various locations in Sapporo. Susukino Site: Get off at Susukino Station on Subway Nanboku Line.